A couple of weeks ago I called one of my friends when I was on my way home from work. The reason why I called this friend is because he’s about as unbiased of a sports fan that I know of, and I wanted to ask him a question that would basically determine how my entire summer would go (and it wasted the time it took to drive home). Once my friend answered the phone, I asked him the question I had been sitting on ever since the Celtics unloaded on the Golden State Warriors April 1st. Me: Do you think Boston has a legitimate shot at Kevin Durant? Friend: If he decides to leave, yes. My friend played Devil’s advocate and basically asked me to pitch him on the idea of why Durant should join the Celtics (assuming he leaves OKC & get an extra piece such as Al Horford). From the moment Durant’s pen hits paper, to the moment he lifts his pen to signal he has finished signing a contract, he will already be one of the five or six greatest Celtics to ever wear the mystique green. We aren’t talking about the Oklahoma City Thunder, we aren’t talking about the Washington Wizards, Los Angeles Clippers, New York Knicks, or the Golden State Warriors. We’re talking about the most successful franchise in the history of the National Basketball Association. Even a franchise with history as deep as the San Antonio Spurs or Miami Heat, they can’t touch what the Celtics have done in Boston. Boston is the cream of the crop in professional sports. The highest of elite in terms of sports towns. The tradition and history of the Boston Celtics is not only what makes the city of Boston so unlike any other team flirting with the idea of signing Durant. But Boston is the team that helped Durant fall in love with the game of basketball. Growing up as a youngster, he fell in love with Larry Bird and continues to watch film of him today. He has listed Bill Russell in his top 5 dream NBA dinners. He expressed his opinions about Boston after playing at the TD Garden this season by saying, “Tradition of being a Boston Celtic is second to none”. He simply understands how important that is. Durant gets it. While it might seem like that’s the angle Danny Ainge and the Celtics will play, I think they should try something else. Well, to an extent. It’s easy to throw smoke and fireworks at Durant about how he can raise banner number 18, or become the next pillar of this historic franchise. It’s easy to say how much weaker the Eastern Conference is, or to show them pictures of Celtics legends smoking their championship cigars. It’s more than saying Brad Stevens is one of the best coaches in the game. Durant knows all this. Well, and so do the Celtics. So, apparently they’re (for real) actually bringing in Tom Brady for the meeting. Yes, Tom freaking Brady. The greatest quarterback to ever play the game. I’m going to say it again because I can’t believe it’s true — the Boston Celtics are bringing Tom Brady to the Kevin Durant free agency meeting. They’re bringing in possibly the greatest Boston sports figure ever, to lure in Durant. What a brilliantly badass unprecedented move by the Celtics. Tom Brady: Kevin, if you come to Boston you can be like me. The fans here will never neglect you, the media will cover your entire back, and you’ll be forever grateful by this decision. If you can win one championship here, your number will hang in the rafters of greatness with all these other basketball legends. You’ll be a Boston hero. If Durant was to actually sign in Boston, it would start a long line of free agents this summer and next summer that would want to follow him in pursuit towards a championship. What makes Boston different than anywhere else is that they have the cap flexibility to sign any free agent Durant would want to play with in the next two seasons. They also have the assets — future Brooklyn picks, young talent, and several other picks from teams — to package together in a trade for virtually anybody on the available market. Or they can hold onto those picks and improve the roster the way the Thunder were originally built, through the draft. Durant would finally be able to dictate his own team and shuffle a roster to the way he’d like, if he wanted to. He isn’t going to be able to do that in San Antonio, Golden State, Los Angeles, New York, OKC, or even Washington. Boston is always in win now mode and will move mountains for their superstars. While looking from the outside in at these team meetings, Durant needs to understand that Boston is the only team that can sign TWO max contracts without moving a single player away from their current roster. In theory, signing with some of those other teams make a lot of sense, but in order to obtain Durant, their front offices would have to do some juggling for it to happen. Not in Boston. Add Durant to the current roster and that’s what you get. Having roster control is great if you’re a superstar, but Durant might not even need it in Boston. Having trade chips and assets such as Avery Bradley, Jae Crowder, and Marcus Smart on the deals they have would be a colossal loss in value if they were to be traded. In Durant’s entire career he has never played with any perimeter players as defensively talented as Bradley, Crowder, or Smart. And it isn’t even close. Having that three headed defensive juggernaut on the floor with Durant and Thomas, or (enter free agent’s name here) would be a luxury that Durant has never had the opportunity to experience. Not only would he be able to focus more on the offensive side of the floor, he’d know his teammates had his back down the crunch time of games. Assuming Ainge is able to get his hands on Al Horford, imagine the lineup flexibility and creativity that Brad Stevens would generate with core players such as Isaiah Thomas, Kevin Durant, Al Horford, Avery Bradley, Jae Crowder, Marcus Smart, Kelly Olynyk, Jaylen Brown, etc. Durant showed his defensive potential in the playoffs this season as he was ridiculously locked in on that side of the ball. Adding Durant’s ability to switch screens, defend bigs, and use his length to this Celtics team would be unrivaled by anything we’ve seen in the NBA on the defensive side of the ball. Say what you want about the Celtics young players, or how they ended last season, but these guys DEFEND. With absolutely zero ability to defend the rim, and a 5’9″ point guard who is naturally a defensive liability because of his size, the Celtics still finished 4th in defensive rating. Of course that’s not even where Durant would do his damage. On the offensive side of the ball, Durant would dramatically flip the offensive analytics of the Boston Celtics. Considering Durant is an all-time great at putting the ball in the basket, the attention he would command would be undeniable in this offense. Even if you added an Al Horford to the mix — or somebody who can score on the block while stretching the floor — the opponents attention would have to account almost fully towards those two players, especially Durant. The result of a signing like this would create elite floor spacing. This would mean that Isaiah could be even more effective with an upgrade to more driving lanes against his defender. Players such as Avery Bradley, Jae Crowder, and even Isaiah would benefit the most from Durant’s existence as they all flirted back-and-forth with 40% on catch and shoot three pointers. It’s no longer Westbrook stopping the ball or taking a 27% three pointer. Obviously any NBA team that gets Kevin Durant would have massive upgrades to every attribute, especially win totals. However, it’s a team like the Boston Celtics that make a perfect match for him. Boston stands for everything that Durant is, while allowing him to not sacrifice any of his superstar ability to other teammates. Boston showed they could eventually become a contender once again in this league with the group of guys they have. All they were missing was that final piece to push them over the edge. Kevin Durant is obviously that guy. Kevin Durant would be adding more to his own legacy if he were to raise banners in Boston than he would anywhere else. That’s just a fact. By adding Durant (and Horford), the Celtics would easily have one of the game’s top defenses and perhaps one of the best scoring offenses. What makes it crazy is how easily they could add two players without making any further roster adjustments and be ready for a series of war against Cleveland. Adding Durant to the Celtics could perhaps conquer King James, while Boston’s Mr. Reliable went on to win his first NBA championship. Having Tom Brady come to this meeting speaks more about Boston than it does about Kevin Durant. Sure, it shows how much respect Durant commands, but Brady is coming to express how Boston truly is a sports family. Brady isn’t even from the New England area, yet he has fallen in love with the people and the other teams around his Patriots. Brady has the ability to come in and describe first-hand to Durant what it’s like to win multiple championships in Boston as a star player. He can express the loyalty of Boston in ways that few others can. Boston fans have fallen in love with Durant just based on the thought that he might possibly sign with the Celtics. They’re in love with him for even agreeing to have a meeting. Boston is clearly just a long shot to get Kevin Durant, with or without Tom Brady at the meeting. With that being said, you have to admire their willingness to try anything. When given the correct ingredients, Boston teams have proven year after year after year that they won’t let you down. 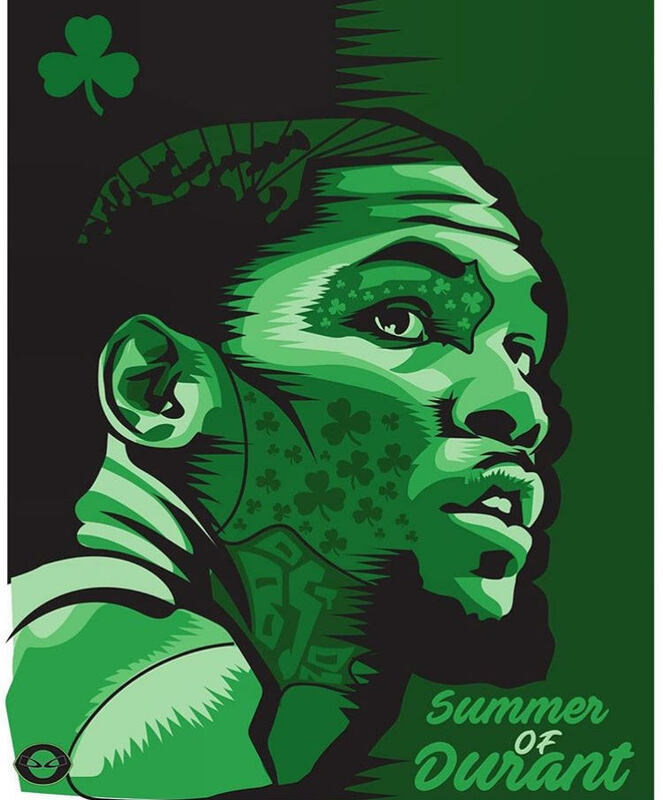 If Durant gives Boston an opportunity, I promise he will prevail.